Experience the greatest sports fishing charter in Connecticut. Book your trip today! Striped Bass, Black Fish, Fluke, Jumbo Sea Bass and Bluefish. We catch them all and so will you! Whether you’re entertaining clients or enjoying a day with family and friends, we’ll offer you an unsurpassed day of charter fishing in CT with the most fun loving professional crew you could ask for!! The Sea Sprite is located at the mouth of the Connecticut River. Central to Plum Gut, The Race, Sluiceway, and shoals, wrecks and reefs within 12 miles. People have traveled hundreds of miles to fish from Old Saybrook's Sea Sprite Sportfishing Charters for Striped Bass, Black Fish, Fluke, Jumbo Sea Bass and Bluefish. 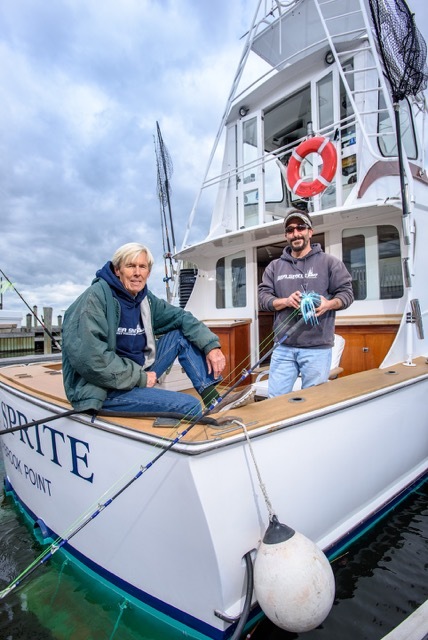 You won't want to miss the opportunity to fish Old Saybrook and Eastern Long Island Sound waters with the Connecticut's #1 Captain Pete Wheeler. Your day will be action packed after the Sea Sprite's professional mates help and guide you with all the Charter-Fishing techniques perfected during Captain Pete's 43 years of fishing Long Island Sound. Fishing Charters with One of The Best and Longest operating Charter Boats in CT. Whichever you prefer, customer sastisfaction is #1 with us. There is no substitute for experience - we have over 43 years of charter fishing experience on the waters of the Long Island Sound, Plum Gut and surrounding islands. We are the most sought after and longest active charter fishing boat in Old Saybrook. We specialize in catching fish, not looking for fish. We go where they live. Fun for all ages including men, women & children over six. Everyone catches fish on the Sea Sprite!! That's my promise to you! At Sea Sprite Sportfishing Charters, You're always in the Strike Zone! "I frequently go out Striper fishing with Captain Pete. He is a true professional and makes sure you are on the fish. We always catch our limit!" "I have been fishing on the Sea Sprite with Captain pete for 17 years. If your looking for a great fishing experience, look no further. Captain pete knows were the fish are and how to get them. Always a fun time year after year!" "The crew was awesome, can't wait to book another trip. Everyone caught fish"
Captain Pete is a true local captain – not a transplant. Born and raised on the Connecticut (CT) shoreline, he has been operating his charter boat business full time, since 1976. He knows these waters, he knows where the fish live, and he will always put you "in the strike zone".